The near absence of competent movers constitutes some of the challenges the Packing, Removal, and Relocation industry is currently facing and that is why we are committed to offering our customers the best of Relocation experience. Just as fixing your car and other delicate personal or office items are left for professionals to handle, so also should the packing and relocation of sensitive or valuable items be outsourced to experts. This is because the planning, coordination, and implementation of a removal project requires more than the help of family and friends. It requires expertise in packing, safety, inventory management, and delivery at the right time and in the best condition. 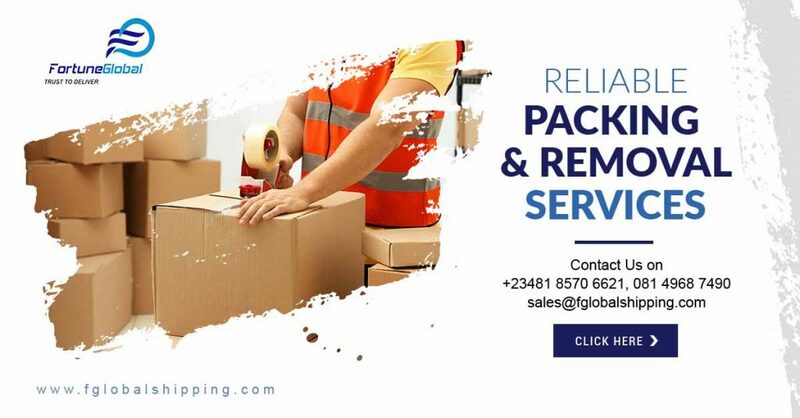 Again, whether you’re moving in-country, across regional borders or cross-continental distances, the benefit of hiring a competent Company like Fortune Global Shipping and Logistics Limited far outweighs the risk of doing otherwise. Prior Inspection / Evaluation: A comprehensive inspection process that will help in determining the management, coordination, and delivery of items to designated locations across diverse local and international locations. This will involve a variety of packing methods (as the occasion demands) like with emphasis on the quality of packing materials used and professionalism in handling sensitive items, inventory management, and documentation advisory. Regulatory Requirements: Best practice procedures that are both geographically specific and universally acceptable. These are key considerations that must be clearly communicated and understood by customers who want to be served better than ever before. Storage: An excellent storage system that comfortably holds your items in the safest manner possible during transition (if the need arises). This is particularly important when relocation to the actual destination could take some days or even weeks due to unanticipated logistical factors. Global Reach: A global network of Movers to facilitate the movement of your items across diverse global locations seamlessly. Expert Knowledge: Expert understanding of the nature of items to be moved and the best packing materials to use is necessary. This also requires a clear understanding of other technical intricacies including documentation and capacity to move sensitive materials across diverse domestic and international destinations. Proactive Approach: We plan well ahead of time to avoid unpleasant surprises. Our team of highly experienced experts is well positioned to deploy the easiest, safest and fastest methods of Packing and Relocating your valuable items to the designated location. We take the burden off your shoulders: You need not worry about when, how and who is required for your relocation. We deploy the most appropriate packing materials for specific occasions and help you move to all locations across the globe via the safest means of delivery. Relocating made easy: We save you from the stress of having to do it yourself. We handle your most sensitive and delicate materials with so much ease throughout the entire journey. Competitive Cost: From the evaluation stage to Packing and then trucking/shipping to designated locations, we adopt the most cost-effective methods. We secure your items with our Goods-in-Transit insurance and save you from unplanned expenses.